Two separate questions motivate most of my research. 1. How do geodynamic processes in the mantle build high terrain, such as the Tibetan Plateau or the Andes? 2. What geologic processes have altered regional climates and how have they done so? Among specific climate questions are: what geologic process changed the Northern Hemisphere from being largely ice free for 300 million years to a state with recurring ice ages starting roughly 2,5 million years ago, and how has the rise of the Tibetan Plateau altered Asian climate, including the South Asian monsoon? 1. A big controversy in geodynamics concerns how mantle lithosphere, the cold top part of the mantle below the crust, can be removed, as seems to have happened beneath many mountain belts and high plateaus. Presumably this occurs by some form of convective instability, for cold mantle lithosphere is thought to be denser than the hotter material beneath it. Intermediate depth earthquakes (70 km < depths < 300 km) in the Hindu Kush region of Central Asia, seismically the most active in the world in this depth range, show that the material in which they occur is stretching vertically, as might be expected if mantle lithosphere is sinking rapidly (like paint dripping from the ceiling). Strain rates in this stretching material are much higher than those in the overlying crust, as measured with GPS. I pursue this with Rebecca Bendick at the University of Montana, and we think that mantle lithosphere is caught in the act of being removed. 2. Regarding ice ages, did the emergence of islands in Indonesia alter Canadian climate enough to permit ice sheers to grow there? The logic: (1) islands attract rainfall; (2) enhanced rainfall leads to a warmer upper troposphere; (3) which strengthens atmospheric circulation, like the Walker Circulation; (4) islands have emerged in Indonesia over the past 5 Myr (see Figure); (5) causing the Walker Circulation to strengthen since that time, and transform eastern tropical Pacific sea-surface temperatures from El Niño-like and warm, to the cooler, more La Niña-like as now; and (6) during El Niño events, Canada is warm enough to melt last winter's snow, but during La Niña such melting occurs less readily. I seek to understand the role of islands in rainfall, but tasks ahead include looking at larger-scale circulation. I use a cloud-resolving model to study precipitation over islands to understand the degree to which more islands would lead to more rainfall, more ascent of air in the region including the islands, by analogy a stronger Walker Circulation, and ultimately shorter summers in Canada that would permit ice sheets to grow there. I work with Tim Cronin at MIT. 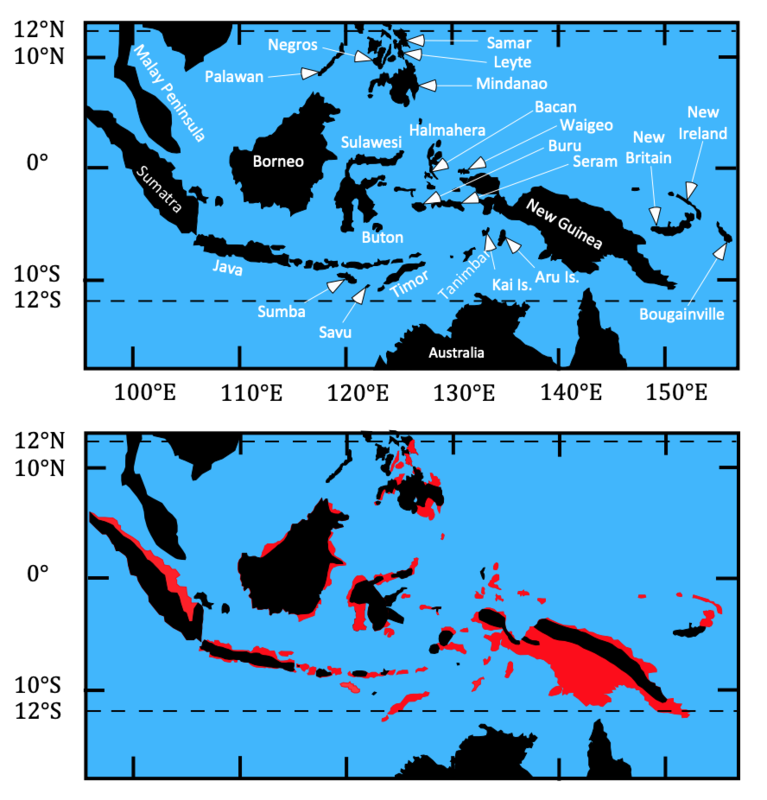 Maps of the Indonesian region showing present-day (top) emergent regions (black) and (bottom) emergent regions 5 million years ago (black) and land that today is emergent, but was submerged (red).